In 1975, sentiment amongst Americans shifted dramatically as much of the anger and rebellion from the 1960s began to evolve into a desire to calm down and enjoy life as fans of the Brady Bunch and K.C. and the Sunshine Band. 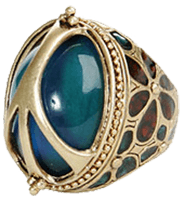 As the moods of society were changing, society seemed to need a device to monitor this change – hence the birth of the mood ring. All fads seem to have a very limited lifespan but the lifespan of the rings was actually fixed, in that the rings crystals would only emit the color changes for a period of two years before they would settle permanently into a shade of black. As such, by 1977 the rings were no longer a hot item and would quickly slip into fad-dom.